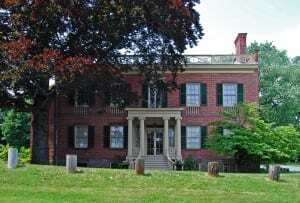 The Albany County Historical Association (ACHA) has announced an Easter Egg Hunt in the Garden of the Ten Broeck Mansion has been set for April 13th, at 11 am. Attendees can bring their own basket or bag, or ACHA will have paper bags available to gather goodies. After the egg hunt, enjoy some light refreshments. This event is free, though pre-registration is requested. To register, visit Ten Broeck Mansion’s website. You only need to register for those who will be participating in the event – you do not need to register for parents/guardians who will be attending with egg-hunters. The Ten Broeck Mansion is located at 9 Ten Broeck Place in Albany. Free parking is available, accessible via Livingston Avenue and Ten Broeck Place. Additional free street parking is available on Ten Broeck Place and Livingston Avenue. Photo of Ten Broeck Mansion provided.